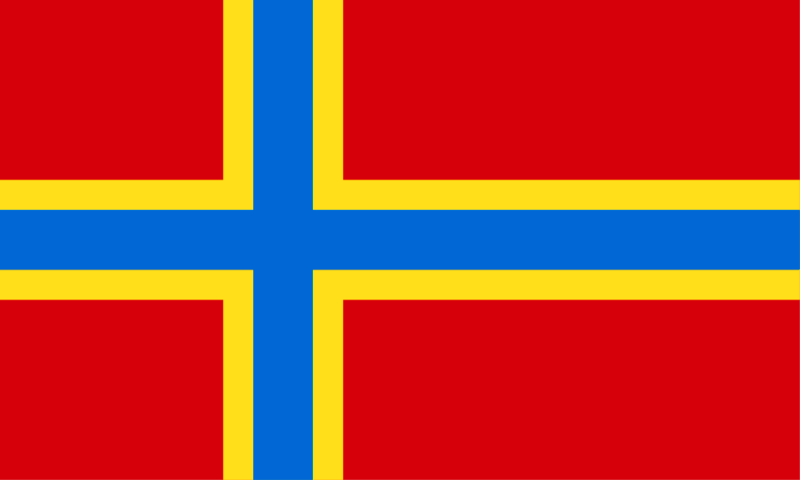 was previously used as the county flag and was inspiration for the current one. for himself. The king then raided along the west coast of Scotland and attacked Anglesey. Professing religious convictions. Magnus refused to participate in the raid and is reported to have sung psalms on board ship! Magnus having first prayed for the souls of his executioners. The sagas recount that the martyrdom occurred after Easter, on 16 April and it is estimated that this was probably in 1117. Magnus was first buried on the spot where he died which rocky area, legend holds, miraculously became a green field! His mother Thora, later asked Haakon to allow her to bury him in a church and his remains were interred at Christchurch at Birsay. was constructed shortly afterwards, at or near the supposed site of the murder. The saint’s bones were subsequently transferred to the cathedral. On 31st March 1919, a box containing bones, including a damaged skull, was discovered in a hidden cavity in a column, during restoration work. These are believed to be the bones of the murdered saint. They were replaced in the pillar in 1926, with the site marked with a cross. This entry was posted in Orkney. Bookmark the permalink.